Fish swallowing soldier, parting of the Red Sea mosaic, Huqoq. Credit: Jim Haberman. 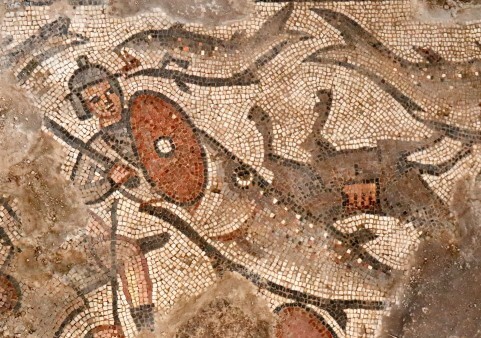 Excavations in the Late Roman (fifth century) synagogue at Huqoq, an ancient Jewish village in Israel’s Lower Galilee have discovered ornate mosaics. The excavations are directed by Jodi Magness, a professor in the University of North Carolina at Chapel Hill College of Arts and Sciences, along with Assistant Director Shua Kisilevitz of the Israel Antiquities Authority. The mosaic panels decorating the floor of the synagogue’s nave (center of the hall) portray two biblical stories: Noah’s Ark and the parting of the Red Sea. The panel with Noah’s Ark depicts an ark and pairs of animals, including elephants, leopards, donkeys, snakes, bears, lions, ostriches, camels, sheep and goats. The scene of the parting of the Red Sea shows Pharaoh’s soldiers being swallowed by large fish, surrounded by overturned chariots with horses and chariot drivers. Mosaics were first discovered at the site in 2012, and excavations have since continued each summer. 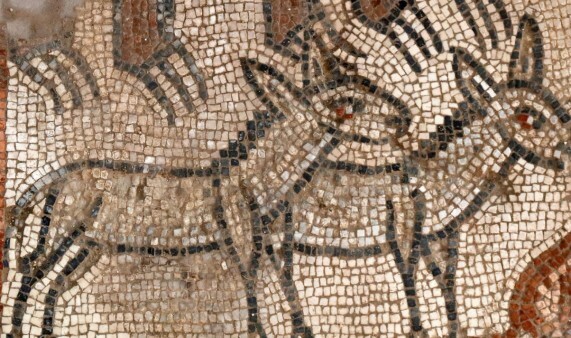 In 2012, a mosaic depicting Samson and the foxes (as related in the Bible’s Judges 15:4) was found in the synagogue’s east aisle. The next summer, an adjacent mosaic was uncovered that shows Samson carrying the gate of Gaza on his shoulders (Judges 16:3). Another mosaic discovered and excavated in the synagogue’s east aisle in 2013 and 2014 depicts the first non-biblical story ever found decorating an ancient synagogue — perhaps the legendary meeting between Alexander the Great and the Jewish high priest. A mosaic panel uncovered in 2015 next to this scene contains a Hebrew inscription surrounded by human figures, animals and mythological creatures including putti (cupids). The mosaics have been removed from the site for conservation, and the excavated areas have been backfilled. Excavations are scheduled to continue in summer 2017.